When do you use “learnt” and when “learned”? Is learnt UK English and learned US? Is it that simple? I’m used to using learnt, but my US spellchecker says it is wrong. 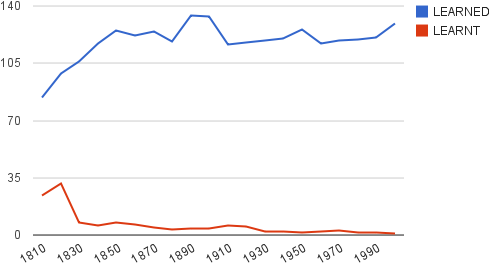 [The Corpus of Historical American English] shows that learned has always been more common than learnt in American English. At least, since 1810. It is worth noting that Merriam-Webster, Wiktionary, the American Heritage Dictionary of the English Language, and Collins English Dictionary all list learned as both a verb form and an adjective, but learnt only as a verb form. Lastly, here's a related question: Dreamed vs. Dreamt, Leaped vs. Leapt, Lighted vs. Lit. In American English, "learned" is the usual spelling; "learnt" is too rare. Not the answer you're looking for? Browse other questions tagged american-english orthography british-english past-tense ed-vs-t or ask your own question. Is there a difference between Therefor and Therefore? What else can you learn other than phrasal verb and idioms to sound like a native english speaker? Why does my spellcheck disallow themself, but not themselves?